Home /Blogs /John Tierney's blog /Living and dying in Ireland 100 years ago. How to follow the clues! Peter was buried in a public section of St. Joseph's Cemetery on the south side of Cork city. We know this because the burial receipt is for 6 shillings for opening a grave. When you can't afford to buy a grave plot you pay for the opening and closing of the grave instead ie. the gravediggers labour. The same grave might be reused at a later date as the family does not own the piece of ground. I know the receipt says owner of grave at the top but as they do not detail the row or grave plot number, as the money paid is put against opening a grave, I'd be fairly sure this was a public grave section of the cemetery. The public section of a cemetery is often called the pauper's section but that always strikes me as too definite. Plenty of people, in the past and today, struggle with burial costs but that doesn't make them paupers. Does it? Now we've searched census.nationalarchives.ie to find Margaret in 1901 and 1911 and we can't identify her. 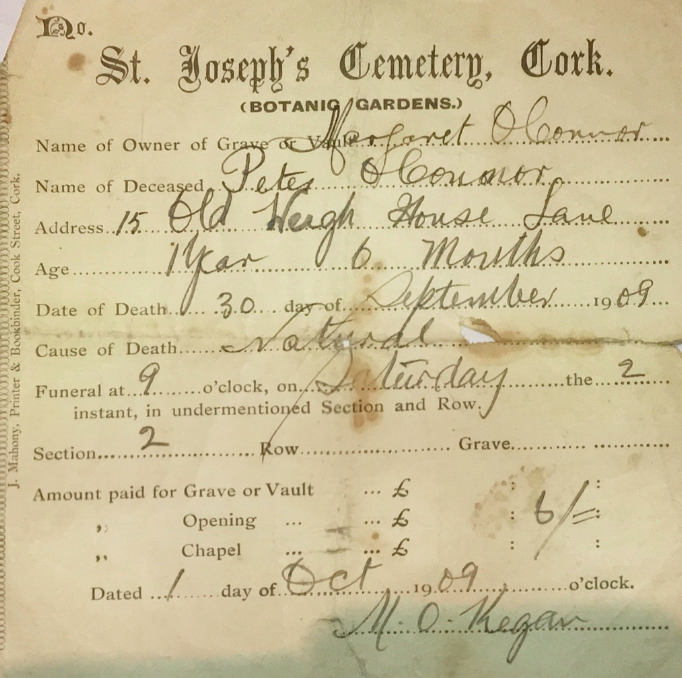 The receipt tells us young Peter lived in Old Weigh House Lane in Cork city. 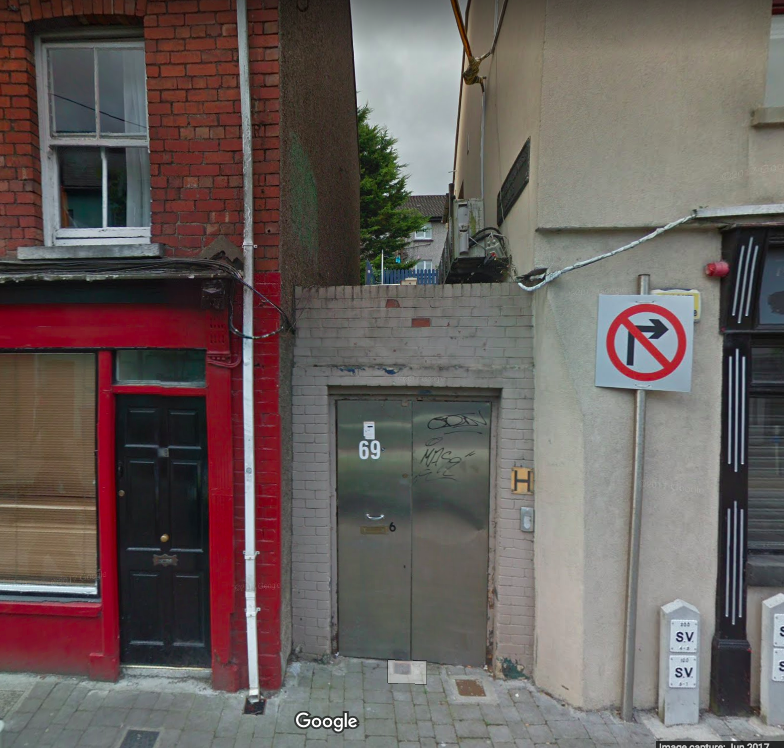 That street name is now gone in Cork but the Cork City Libraries section have an online map of many of the old lane names in Cork and sure enough Old Weigh House Lane is on it. The red dot on the google map shows the general location of the old city lane. The information table says it is 'off Barrack Street'. Barrack Street is one of the arterial routes into Cork city. It connected the S&W of county Cork to the city. It's siblings on the north side of the city were Shandon Street & Blarney Street. These three streets were then where many people lived in lower grade housing conditions. Now, we do not know exactly where young Peter is buried. But we have a chance of seeing where he lived in his few short months. 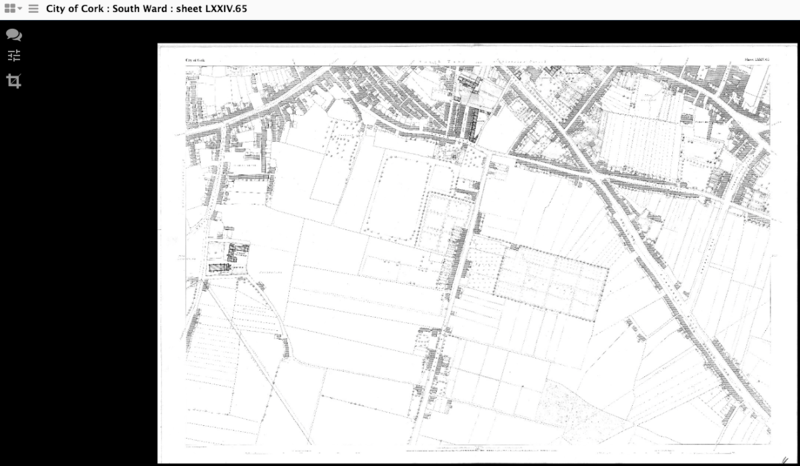 There is an excellent collection of very detailed historical maps of Irish cities and towns at a UCD archive website. We are used to looking at the 6 inch OS maps but the more detailed version of these maps are at a better scale and they are called the '5 foot' maps. The index for Cork city is here. This index leads us to map 65 which we can zoom in and out of to see the old lane names. Off Barrack Street we can see Beale's Square, Blackhorse Lane, Griffin's Lane, and a very small tight Sullivans Lane. And there in the top left hand corner is Desmond Square and leading to it Old Weigh House Lane. If we rummage for this location on google maps this is where we end up https://goo.gl/maps/HAEBLDmjjs12. No sign of Old Weigh House Lane placename surviving but there is an O'Leary's Place. 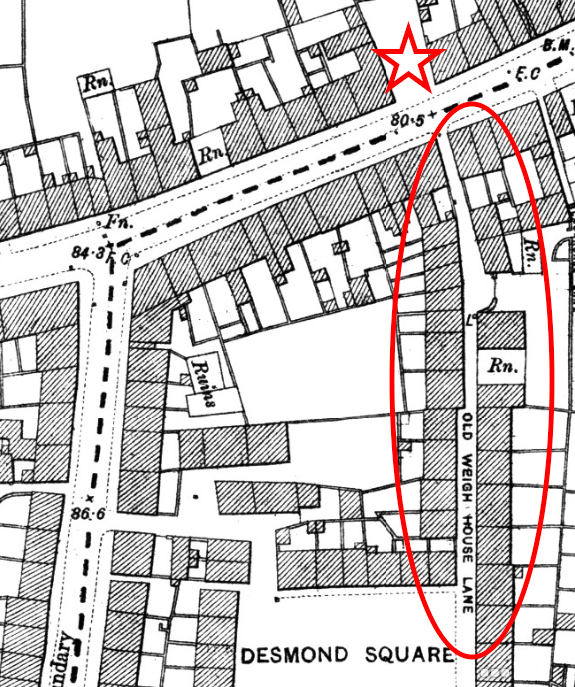 As Old Weigh House Lane and O'Leary's Lane were opposite one another we can now identify the remnants of the lane where Margaret & Peter O'Connor may have strolled on happier days. Now we know where Peter lived for his short life. To find out where he is buried we need to visit St. Joseph's cemetery and find Section 2. But that is a task for another day. We have done some work in St. Joseph's cemetery but urban burial grounds are often more difficult to get funding for, for community surveys. If you wish to directly support community groups to survey their graveyards then please consider making a donation to the project and write to john@historicgraves.com with any ideas you may have for surveys.